The number of housing of Saint-Clément-de-Rivière was estimated at 2 148 in 2007. 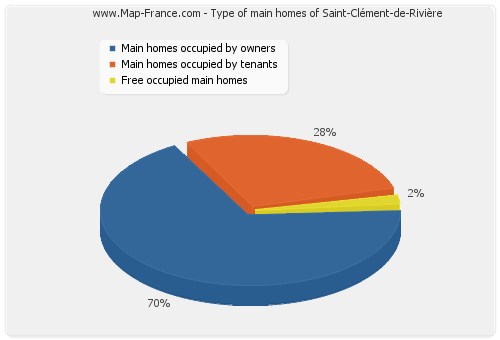 These accommodation of Saint-Clément-de-Rivière consist of 2 069 main homes, 26 secondary residences and 52 vacant accommodation. Area of Saint-Clément-de-Rivière is 12,73 km² for a population density of 395,92 habs/km² and for a housing density of 168,74 housing/km². 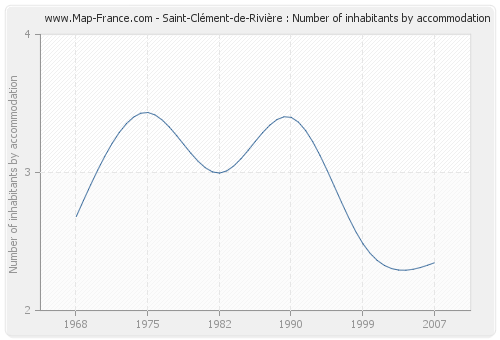 Here are below a set of graphic, curves and statistics of the housing of the city of Saint-Clément-de-Rivière. Must see: the population data of Saint-Clément-de-Rivière, the road map of Saint-Clément-de-Rivière, the photos of Saint-Clément-de-Rivière, the map of Saint-Clément-de-Rivière. The number of housing of Saint-Clément-de-Rivière was 2 148 in 2007, 1 844 in 1999, 1 248 in 1990, 701 in 1982, 276 in 1975 and 88 in 1968. In 2007 the accommodations of Saint-Clément-de-Rivière consisted of 2 069 main homes, 26 second homes and 52 vacant accommodations. 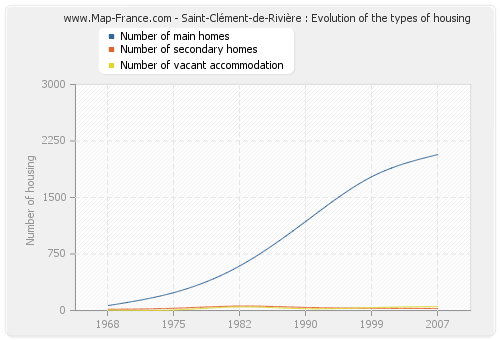 The following graphs show the history of the number and the type of housing of Saint-Clément-de-Rivière from 1968 to 2007. The second graph is drawn in cubic interpolation. This allows to obtain more exactly the number of accommodation of the city of Saint-Clément-de-Rivière years where no inventory was made. 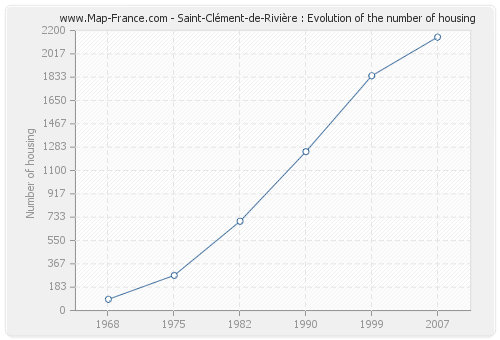 The population of Saint-Clément-de-Rivière was 5 040 inhabitants in 2007, 4 579 inhabitants in 1999, 4 242 inhabitants in 1990, 2 100 inhabitants in 1982, 948 inhabitants in 1975 and 236 inhabitants in 1968. Meanwhile, the number of housing of Saint-Clément-de-Rivière was 2 148 in 2007, 1 844 in 1999, 1 248 in 1990, 701 in 1982, 276 in 1975 and 88 in 1968. The number of inhabitants of Saint-Clément-de-Rivière per housing was 2,35 in 2007. 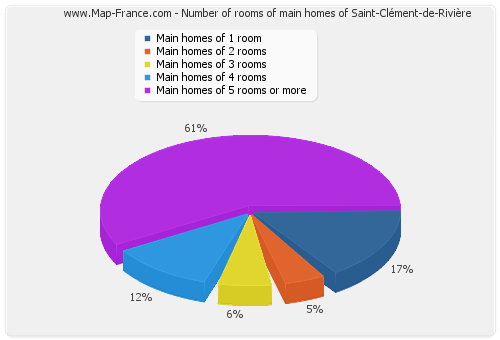 The accommodation of Saint-Clément-de-Rivière in 2007 consisted of 1 609 houses and 534 flats. 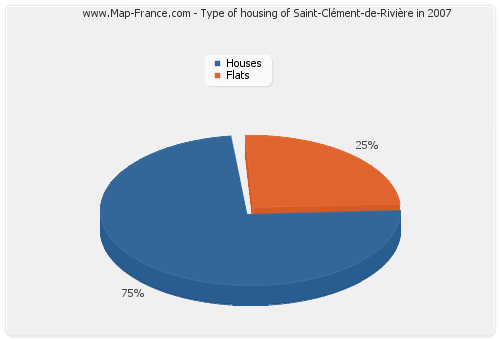 Here are below the graphs presenting the statistics of housing of Saint-Clément-de-Rivière. In 2007, 1 438 main homes of Saint-Clément-de-Rivière were occupied by owners. 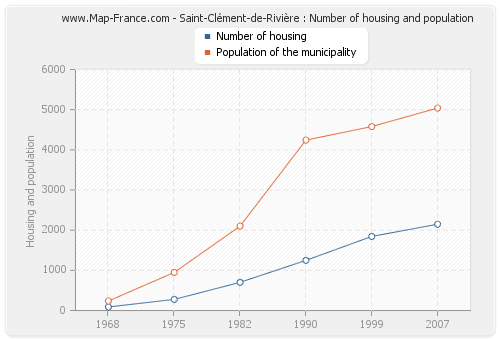 Meanwhile, 2 069 households lived in the city of Saint-Clément-de-Rivière. 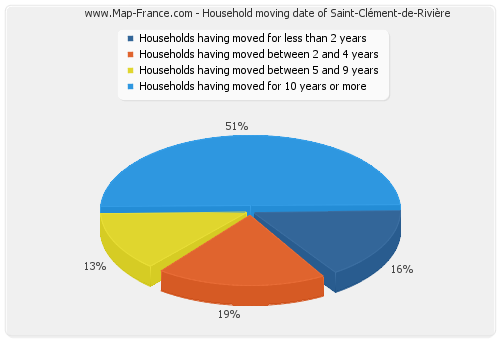 The following graphs present the statistics of these households of Saint-Clément-de-Rivière.